Advanced Dungeons & Dragons: Heroes of the Lance is a video game released in January 1988 for various home computer systems and consoles. The game is based on the first Dragonlance campaign module for the Dungeons & Dragons fantasy role-playing game, Dragons of Despair, and the first Dragonlance novel Dragons of Autumn Twilight. 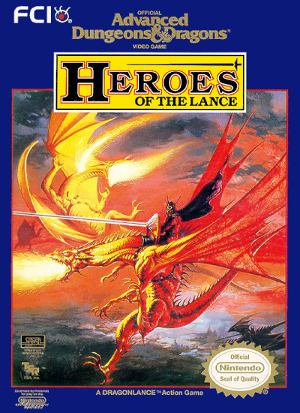 Heroes of the Lance focuses on the journey of eight heroes through the ruined city of Xak Tsaroth, where they must face the ancient dragon Khisanth and retrieve the relic, the Disks of Mishakal.